“You can’t argue with a word like ‘fraught’.” The conversation continues. Tigger is my favorite character within the Hundred Acre Wood, and that fact may explain why the word fraught became my favorite word after Tigger advised Roo. Here is a trailer to the movie, which includes the ‘fraught’ scene. Would you kick me if I said that post was fraught with hilarity? I love when you talk to yourself. It makes me feel, well, less crazy. And I’m diagnosed with bipolar and OCD so that’s a lot of crazy. You make me feel sorry for my parents, though, who just had my step-brother with them for a week. He’s schizophrenic so that’s a lot of self talking. With hand gestures. P.S. I LOVE PUMPKIN FRAP SO THERE OMA! Kick you?! No! I’d hug you! I am glad you thought this was fraught with hilarity! Bonus hugs for using ‘fraught’! I am glad I am able to help you fee a little less crazy, Kim. Everyone needs a friend like me (and me), eh? You can stop watching “Cops” and “Jerry Springer”, because I am crazy enough to help you feel normal. I figured I might as well milk my self-conversations for what’s its worth – because the conversations flow frequently. I use hand gestures when talking with real live people. I don’t use ’em so much with myself. I guess that’s one saving grace, eh? I’ll tell you in the original Winnie the Pooh Disney cartoon, the Huffalumps and Woozels scared the crap out of me. Now I’m going to be thinking of that all day. Steve, I am certain – CERTAIN – the illustrators of the original Winnie the Pooh were doing LSD when they created the Heffalumps and Whoozels. Those things scared the crap out of me when I was young. (My kids, too.) Lumpy is a kinder and gentler heffalump. No nightmares. And, I thought of you when my internet went down – because you and I chatted a bit on Sunday (or was it Monday?). Who knew I’d be relating to your situation minus the snow? Glad you liked the post, Darla. I am to please. Me, too! 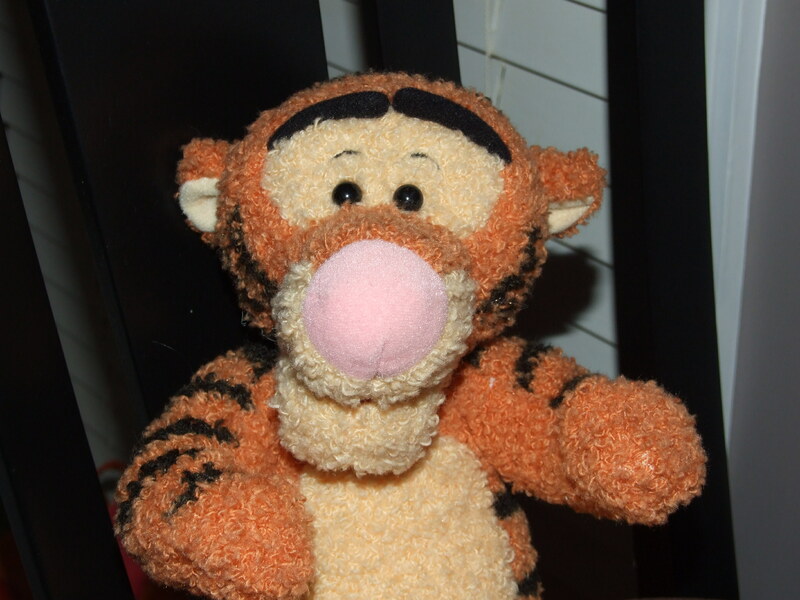 I remember my mother picked up the girls a Tigger. It bounced when you pushed a button and it said “Bouncin’ is what Tiggers do best.” Never understood the plural of Tiggers. I thought there was only one, until now. Now I get it. Aw man, Georgette! Now I don’t get it. 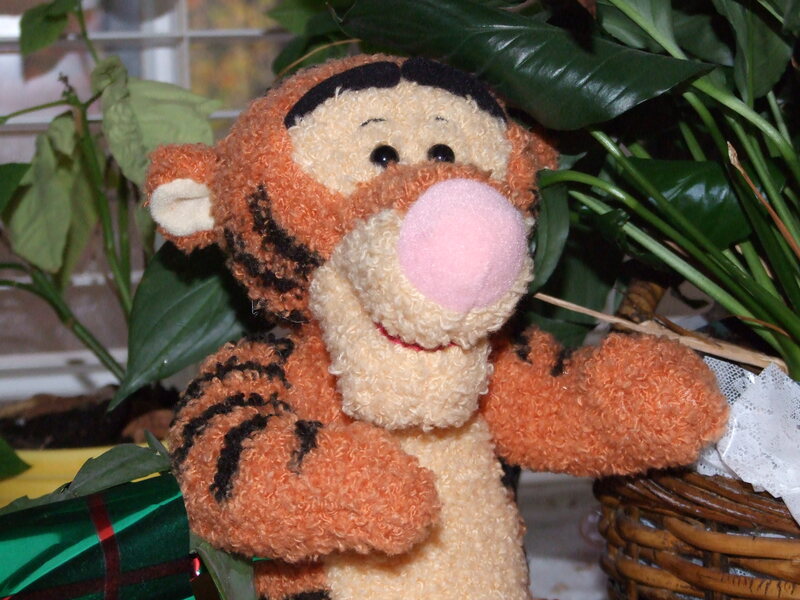 Why is Tiggers plural when there is only one. Oooooooh. Wait a minute …. he talks to himself like I do! See?! I KNEW I liked Tigger best! Your ‘conversations’ are always so civilized, LD, how do you do it? Editing, PW. Lots of editing. I love how you talk to yourself like you are your best friend…that is priceless. Maybe I’ll start doing that. We – er – I have that affect on rooms. Glad I made you laugh! You get along so well with yourself. Conversations with myself usually end in screaming and rending of clothing. Fraught is a great word. I’m fond of the word mirth. It’s fun to say. We’ve been land-line free for years and haven’t missed it. No internet until Monday? I don’t think I could make it. Ours was out for a few hours last night due to a storm and I had to keep a wooden spoon handy cause the withdrawal spasms were so bad. Hope you make it through the weekend! I had to make through the weekend and beyond, Amy. I’m back now, though. Some residual shaking remains…. Too funny Lenore! Good luck getting your service back on. Brilliance, Jacquelin! My lack of internet did not allow me to respond to your brilliance until today. I am bowing down to you. Your use of fraught was excellent; adding the alliteration was the cherry on top! Lenore in this post you actually made us confused, you actually throw us for loop, you actually made us laugh. So you made us to react while reading this one, the way you wanted. So Hats off to your imagination. And its always feels great when someone write something unique. It was one of them. Congrats! Keep Writing! I greatly appreciate your compliment. Thank you! Lenore Can i make your blog part of my blogroll? Certainly, Arindam. Thank you for including me. I love love love the Airplane reference. And I’m with you about flavored coffees. Way too sweet. Oh, technology. I feel like I’m the world’s last dinosaur. I like gadgets well enough but I will not get rid of my old Bakelite rotary phone or stop reading a good, crinkly newspaper. You got the Airplane reference, eh? Great taste, Leonore. Great taste. I am still chuckling. You have a way with endings, Lenore. They satiate, and make one ask for more, all at once. Thank you very much, Priya. I love the word ‘satiate’, and I am honored you used it to describe the ending. As always, I appreciate you spending your time here. Thank you. That’s funny, Deb. Hopefully you’ll remember all of the above this time next year…. prior to purchasing, of course. You can call this dialogue crazy if you want to, Lenore, but I know the truth. There are a lot more than two of you in there, and these are the normal ones. You’re not allowed to ask me how I know this. Oh Charles, I won’t ask how you know this – provided you keep it secret. The others are getting nervous … and waiting for me to express their two cents in my blog. The line is getting longer. The wonderful thing about Tiggers, is that Tiggers are wonderful things! …Their tops are made out of rubber, their bottoms are made out of springs! Gotta love that bouncy little guy. They’re bouncy, flouncy, trouncy, pouncy fun fun fun fun fun! I’ve been fraught with anxiety knowing I haven’t been over for a few days. I’m so behind on my reading. How do you keep up? I love it when you talk to yourself. It makes me feel better about the conversations I have with myself, but sadly, mine are not quite as funny. I don’t believe you, Nancy. I’m certain you have funny conversations with yourself, with your kids providing the inspiration. And, I have not kept up with the reading and writing, lately. Slowly, I’m catching up… slowly but surely. Thanks for visiting (and using the word fraught)! David Letterman wanted me to ask if you’d remove that Uma-Oprah reference or he’ll have to resort to legal action. He had hoped everyone had forgot about that by now. An elephant never forgets, though I’m not sure what that has to do with the price of peanuts. Have David’s people call my people – so many people. I thought about Uma -Oprah right away, as well. What I want to know is, how did Starbucks create so much free advertising by having us all blogging about the pumpkin latte? Sorry neither of you liked it – I thought it was yummy. Hahahahahaha! Please tell me ‘sorry neither of you liked it’ was directed to me and at least one of my personalities. I – er – We took it as such and had a great laugh.